The Washington Redskins, which according to Forbes is the world's 4th most valuable sports franchise, and NRG Energy have signed a nine-year deal that will power FedExField with solar instillations starting this September. Officials say the new solar power system will provide a portion of the stadium’s electricity needs on game days and can generate enough power to serve all of its electrical needs on non-game days. The deal is NRG's first pro sports sponsorship. NRG will install three different types of solar panels that together will generate two megawatts of electricity. NRG will cover 850 spaces in the Platinum A1 Parking Lot with 8,000 solar panels. An NRG-branded entry plaza at Gate A will inform fans about renewable energy and showcase clean energy technologies. NRG’s subsidiary, Texas-based Reliant Energy will be the official electricity provider of the Redskins, as it looks to expand both its commercial and residential businesses to into the Northeast. 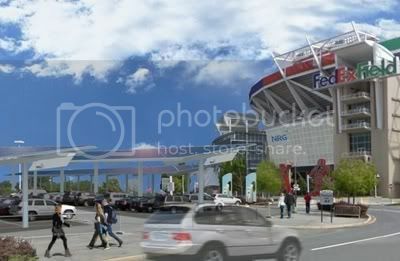 Here's an idea of what the 8,000 solar panels will look like outside FedEx Field..